1. MOST CLICKED LINK: Light Frost Easy Blanket Sweater from Mama in a Stitch – Stylish and cozy FREE crochet pattern! 2. Little Deer Hat from The Friendly Red Fox – Such adorable deer hats … FREE crochet patterns! 3. Abella Triangular Scarf from A Crocheted Simplicity – A cozy and reversible crochet scarf pattern … and it’s FREE too! 4. Mandala Table Mat from Crochet ‘n Create – Fun and colorful mandalas … FREE crochet pattern! 5. My Favorite Beanie from the Stitchin’ Mommy – Warm and on trend beanie … FREE crochet pattern! I can’t wait to see what you’ve made now! 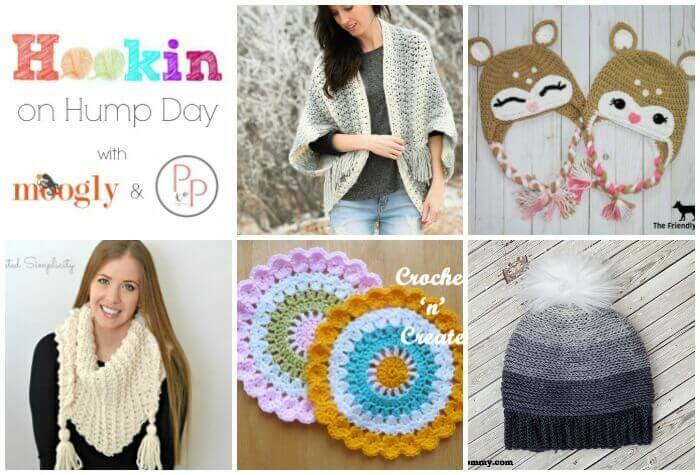 You don’t have to be a designer or a big name blog to join this link party – all you need is to have a post about a crochet, knitting, or fiber arts project you did that you’d like to show off! Remember, this party is in RANDOM order, so there’s no such thing as being late. New to the Hookin’ On Hump Day party? To receive reminder emails twice monthly about the party, enter your email here. Otherwise, I won’t pester you if you’d rather not receive a reminder!